Brendan Irvine is just one win away from clinching an Olympic Games spot after making the semi-finals at the qualifying tournament in Turkey. The Belfast flyweight defeated France's Elie Konki on Wednesday and victory in the semis ensures his place in Rio. Katie Taylor and David Oliver Joyce are also through to the semi-finals. 2012 Olympic champion Taylor beat Denmark's Yvonne Baek Rasmussen while Joyce overcame Vazgen Safaryants of Belarus at lightweight. However, Cavan's Ceire Smith and Cork's Christina Desmond both exited. Smith's split-decision flyweight quarter-final defeat by Ukraine's Tetyana Kob could end the Cavan fighter's hopes of qualifying for Rio. There is a further chance to book Rio places at next month's World Championships but Smith may miss out on the Kazakhstan tests as Belfast woman Michaela Walsh may return to the Irish team for that competition. Walsh was forced out of the current Olympic qualifying event because of injury which led a call-up for Smith. Cork middleweight Desmond won the first round on all three cards against Hungary's Petra Szatmari but ended up losing on a unanimous decision. Kilkenny heavyweight Darren O'Neill missed out on a semi-final spot after losing to top seed Abdulkadir Abdullayev from Azerbaijan. The top three male boxers in each division in Samsun will secure Rio qualification with the women's finalists also progressing to the Olympics in August. 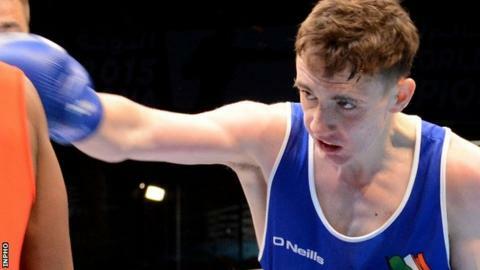 Olympic medallists Paddy Barnes and Michael Conlan have already qualified for the Rio games along with Steven Donnelly and Joe Ward.